Exchange is a pervasive concept in everyday life, affecting phenomena as diverse as interpersonal relationships and market transactions. In addition, economists have used the concept in a highly specific and clearly delineated way. 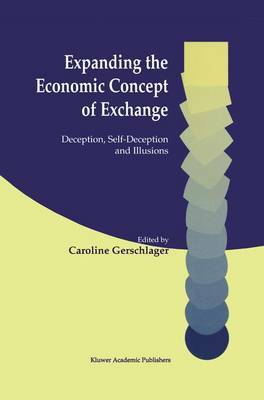 Against this background, Expanding the Economic Concept of Exchange sets out to expand the concept of exchange by crossing the boundaries laid down by economists and by examining the function played by deceptions, self-deceptions and illusions. The main motivation for expanding the concept of exchange was the realization that in the prototypical economic model deception is not taken into account. Hence, economists traditionally regard deception as some sort of irrationality, as a flaw in an otherwise perfectly rational process. Authors represented in this volume take a different approach examining deception as a constituent quality of exchange. This is shown by the contributions drawing on recent developments in economic theory, by those with an anthropological orientation, as well as by a contribution referring specifically to Adam Smith. An interrogation into deception is long overdue in economics. This volume prepares the ground for and makes the first contributions to explicitly acknowledging deceptions, self-deceptions and illusions as fundamental dimensions allowing us as economists to further research and develop the concept of change. A particular and perhaps unexpected focus of this volume lies on anthropology, because economics can clearly benefit from integrating selected results on deception from outside its expanding domain. It is primarily targeted at economists interested in institutional aspects of exchanges and social theory. In addition, the topic will find interested readers from anthropology, cultural studies, science studies, philosophy.